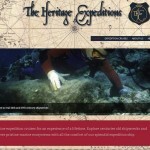 We are pleased to announce that The Heritage Expeditions website is now online. Visit our website to follow our progress and learn about our expedition programs. Our social media channels in Facebook, Instagram and Twitter will be available very soon. Stay tuned for more news!